Hi guys, today's post is just a quick one as I'm so eager to update you guys on some changes I made for my blog. Currently writing at 1:23am after finishing designing the new look and of course finally choosing a name for my blog title yay. This was way back in 2017 where I mentioned in a post here that I wanted my blog to have a title and finally, it's here! I thought hard about choosing names for my blog title so I guess 'La Scrittura Street' pretty much okay for it, right? I cringed at first but after having some thoughts and hundred times reciting the name, I guess it is okay enough. I had to thank Rasya for this actually because my brain started to function well in thinking hard about my blog title after she changed hers. Not to forget Jiha for still being awake at this hour, helping me brainstorming for ideas. Thank you, guys! Anyway here's the chronology of obtaining my blog title; I wanted my blog title to be significant to me, introducing my identity and my love for writing. I had the dream to create a blog title since forever with these criteria in mind but somehow after noticing that Rasya changed her blog title, my brain started working vigorously for ideas and I came up with 'the Writing Street' at first, if any of you noticed. I chose 'Street' as a metaphor for 'Journey'. As a blogger, I had a sweet and sour journey with this page of mine and I wanted to cherish that in my blog title to remind me how much I've grown, how much I've improved my writing this whole time so yea, 'the Writing Street' aka a hipster name of 'the Writing Journey' or so I thought. When I asked Jiha's opinion on this, she said to change the part with 'the Writing' as it doesn't sound cool. As typical as I could be, I started to search for it in other language and I found that it sounds the coolest in Italian, 'La Scrittura'. Obviously, I didn't want to use full Italian words in my blog title teehee and 'La Scrittura' sounds great for a combination with the English word 'Street'. So here it is, 'La Scrittura Street', oh please don't laugh. I'm still getting used to this new blog title of mine and I think I'm falling in love with it so I hope you will love it too. Do you like my new blog title? I hope you do! That's like so cool! and Italian sounds so romantic and sweet. That's absolutely cool! Love it! Nice one! Unik sangat namanya. Bestnya ada nama blog dah! Hehehe kena brainstorm untuk Mai punya pulak la. nice. the blog name seiring dgn maksudnya. ia dtg sekali dgn template yg ditempah. like it. and use it. Cantik gila blog ni. Jeles! 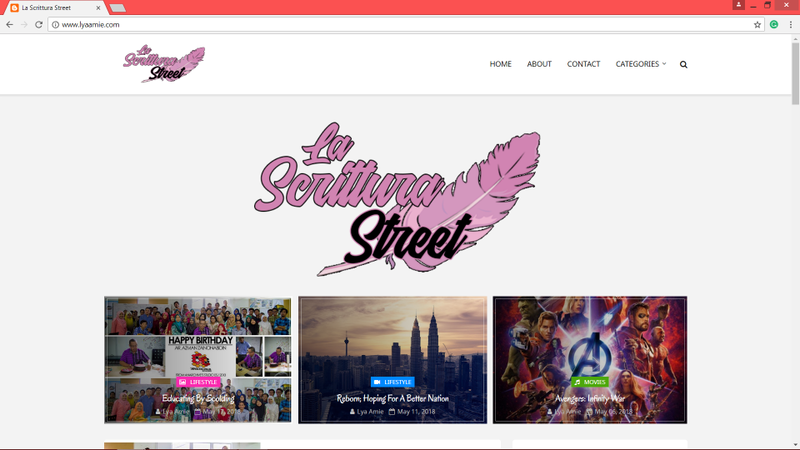 huhuhu..
Ini blogskin ke design biasa yang ambik dari blog tu Kak Lya?